The amazing new fully adjustable carrier from Boba. 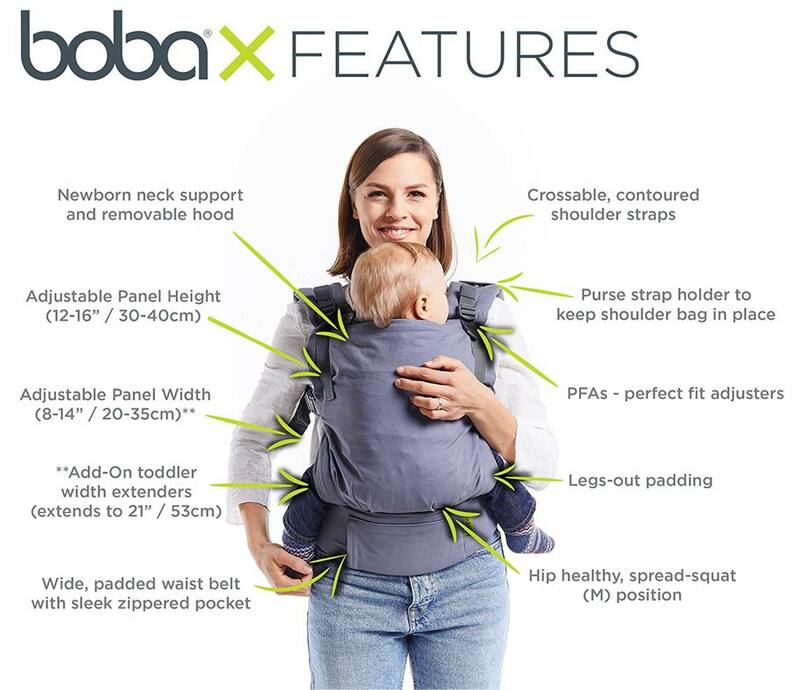 Whether you're carrying your newborn or an on-the-go toddler (7-45lbs) - the Boba X has you covered. The Boba X is adjustable in both the height and width, so there's no need for an additional insert. The innovative seat slides and locks to support your baby’s unique shape, always ensuring complete support, knee to knee. The Boba X comes with lots of thoughtful features such as a quick release breastfeeding assist buckle, a purse holder strap, two discreet hidden zippered pockets, an elastic chest strap that makes everything more flexible and seat extensions for the comfiest ride possible for your toddler. Safe positioning for newborns and toddlers alike (7-45 lbs). A great option for petite and plus sized wearers. Shareable - for both your babies and your partner. Toddler approved - padded leg openings and seat extenders included. An intuitive design that adjusts in width and height without looping, snapping and rebuilding the carrier. Quick height modifications for arms out toddler, breastfeeding help, and head/neck support for sleeping babies. Designed with the help of real mothers and babywearing educators.